Soulful, haunting and melodic are the drop words used to describe the music. He lives his life true to his music; his songs reflect his personal experiences but speak to all of us. 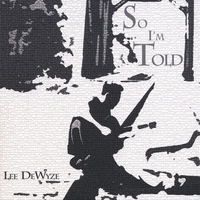 Lee DeWyze is a talented singer/songwriter who relies on melody and emotion to construct unique, memorable, and emotionally charged songs. Dewyze blends elements of many different styles and influences to create his own approach to the traditional typecast of acoustic singer/songwriter. He can change directions in mid-stride, when you think he's going left- he goes up, when you think he's going back- he goes right, and keeping in tune with him has kept producers Louis Svitek and Ryan McGuire on their toes. DeWyze states,"I want a connection with my audience in the sense that any song I do reminds them of a specific moments in their lives-not mine...I want listeners to say 'Wow, he was there when that happened to me. '...It's comforting to share my experiences and know that all the vivid, raw emotions that I felt are universal to all of as human beings." Svitek notes "He always has a new idea and that's great. He also is focused on perfection and when his songs work, they touch on so many levels of the human condition that it is scary." McGuire adds, "His level of talent exceeds many artists twice his age, he never tires of doing the track 'til it's the way he feels it should be. As a producer that makes my job easier." Soulful, haunting and melodic are the drop words used to describe the music of Dewyze, but he hopes that the end product means so much more to listeners. He lives his life true to his music; his songs reflect his personal experiences but speak to all of us. Amongst the music genres of Folk, Emo, Pop, Rock, Alternative and Jazz there lies a space of sonic soundscape that Lee Dewyze inhabits. Known for his energetic and thought provoking performances of well crafted and hooky acoustic material, DeWyze is an artist driven to succeed.